We will not often highlight current events, as the ambition of this website is to promote a larger understanding of an emergent culinary movement, not simply what is currently popular. Yet a number of events occurring the next few weeks are great opportunities to get out and experience the ethno-culinary inspiration that underpins Great Lakes Cuisine. The passion of those who organize these type of events and the experience of the thousands that attend, help build the common experience, the common touchstone, for culinary expectations and innovations. The City of Chicago is sponsoring a festival dedicated to the appreciation of the humble sausage. The European-influenced sausage making tradition in Chicago is not only incredibly strong, it is also deeply tied to the identity of the city itself. Of course, I cannot connect Chicago and the the sausage making tradition without recalling this classic scene from Ferris Beuller’s Day Off, but I was struck upon watching the movie again recently with my children that the restaurant they so cleverly lie their way into is French. How I long for the day when a French child has to lie to get into a classic Great Lakes Cuisine restaurant in Paris. Hey, a man can dream. *Hat tip to our new contributor, Jason Halm, who brought this festival to my attention. The Oktoberfest put on by the Bavarian Soccer Club in Milwaukee is about as authentic as it gets outside of Germany. A classic beer-hall setting with 8 different imported German beers (and a classic version from Lakefront Brewing in Milwaukee), the full polka band experience and guests in lederhosen dancing. For me, this type of experience is all about understanding the traditions and then using those traditions as a launching point for innovation. 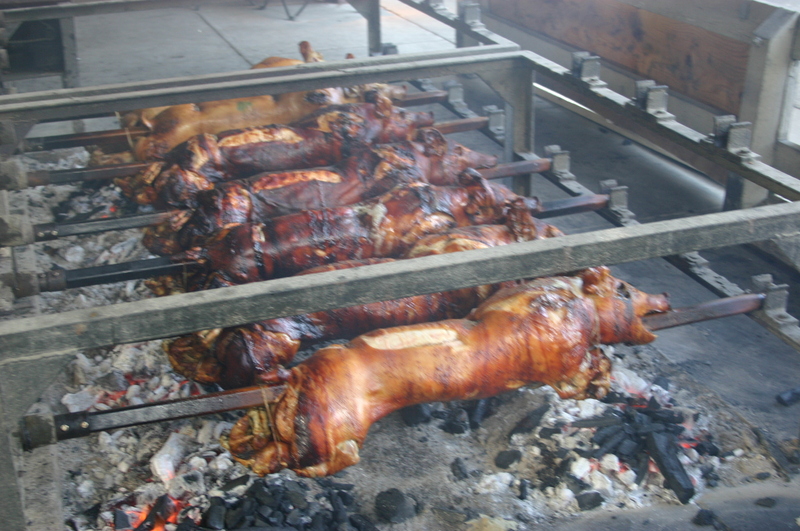 Of course, there is little in the world more inspirational than a spit of roasting pigs. I’ve worked side-by-side with Gunther, the club’s pit boss, in stoking the fires with hardwood charcoal, testing the pigs for succulent completion, and hauling the roasted product into the onsite butchering room, before it goes out to waiting patrons. A pig’s head is often available for sale later in the evening for those that are familiar with such wonders. A wonderful experience, not to be missed. A new event in Milwaukee, centered around meals offered at local restaurants featuring pairings with cocktails. A number of the restaurants have presented great pairings, including one which features my personal vice – bourbon, but the one most relevant to our concept is the intriguing dinner to be put on by one of my favorite local restaurants – Honeypie. Two aspects of this dinner resonate with our concept of Great Lakes Cuisine. First, Honeypie has been doing an amazing job of playing with local offerings, while making all the components for the dishes in-house. So the buns for their stunning hamburgers are made in-house, and glisten with the egg wash finish. The flavors for each dish are clear and full, and innovation is at the service of taste. What makes this a must attend event is a second component of Great Lakes Cuisine, pairing the dishes with cocktails featuring AeppelTreow Winery offerings. AeppelTreow features apple and pear wines and brandies grown, picked, and fermented onsite at their farm in Burlington, WI. They are constantly innovating new offerings, while at the same time featuring the use of Heirloom varietals that they grow. Local ingredients, local craft, culinary traditions, and innovative ideas – the essence of Great Lakes Cuisine. Go forth and festival. Have fun and be inspired. If your only exposure to the traditionally German, fermented cabbage known as sauerkraut is an addition to your brat at the ballpark, the full sauerkraut culinary experience is yet to be opened for you. Slow cooking kraut with a meaty cut or well-made fresh sausage mellows the tang and brings out a fullness of flavors. The transformation is as dramatic as raw onions slowly caramelized to bring out layers of flavor and sweetness. The kraut of choice for a recent preparation of this dish was an artisan offering from The Brinery – Jupiter’s Orbit. I have also prepared this dish with a store bought, Krispy Kraut brand from GLK Foods in Appleton, WI, which is the largest producer of sauerkraut in the world under a great variety of names. With store bought kraut, I recommend a quick rinse in cold water, but The Brinery product required no rinse in advance. For a recent dish, we brined and slow-smoked thick cut pork chops. We have also purchased thick-cut smoked chops from our favorite butcher shop. Smoked ham would work along with grilled seared pork chops. The addition of a couple venison sausages were excellent. If you have access to high-quality kielbasa, that is also an excellent option here. While the meat is being prepared, add one medium onion, sliced thin and saute with a 1/2 tablespoon of dried thyme in a tablespoon of salted butter over medium heat until soft, then core and slice three Gingersnap apples (or similar golden apple). After the apples have softened, about 4 minutes, add the sauerkraut to the skillet and saute for another few minutes. At this point, pile the sauerkraut over your meat of choice in a 13 x 9 pan and bake at 350 degrees for 35 minutes. The result will be moist chops and a complexity to the sauerkraut that is not experienced in the raw state. This is simple and traditional. It suggests more interesting options for sauerkraut. A good friend has a family tradition of adding it to home-made pizza, which may not be Great Lakes Cuisine, but it sure is an intriguing use of an under-appreciated ingredient. Just off the main street headed towards the impressive capitol building in Madison, WI is a small store tucked back on a fairly quiet street. The tiny store front is the retail location for the Underground Food Collective that also operates Forequarter in Madison. The inventory is an eclectic mix of artisan products, both fresh and preserved, with a focus on the products available within the Great Lakes Region. The undisputed star of store is the meats. Upon entering the store, immediately right of the cashier is a butcher case with a set of house-cured sausages and the back of the space is dominated by another beautiful case of fresh cuts. A tiny temple to the art of preparing meat. The opposite walls are selections of artisan products from jams, to pickled vegetables, to cheeses, to spiced nuts. If you are sensing the ultimate charcuterie plate coming together here, you have the right idea. There are non-local artisan offerings such as olives, oils, and wines as well to round out the offering. The cured sausages were the particular treasure I was seeking on this trip and I went home with their Sausaucion Sec, Kabaonosy, and Spruce Goat (tasting notes follow). There were probably another ten cured offerings such as pancetta and bresola that I will have to experience on another trip. An alpine-style sheep’s milk cheese from Bleau Mont Dairy and dried olives were chosen as accompaniments. Finding The Brinery’s offering of Jupiter’s Orbit Kraut was an unexpected addition for the smoked pork chops intended for dinner. The Driftless goat’s milk cheese was destined for a dessert offering later in the evening atop a crumble with plums and ground cherries. Though pleasantly surprised by the unique, local offerings, I might have been able to anticipate such offerings simply based on the review of Forequarter by Lindsay Christians at 77 Square, which brought this group of chefs to my attention. A review of their past offerings lists representative Great Lakes dishes such as modern takes on Pork Schnitzel or Smorgasbord. Even the dish pictured in Christians review is another representative sample of Great Lakes Cuisine, with housemade pork sausage served with sauerkraut and baby potatoes; classic traditional German fare updated with a modern, upscale take. We are pleased to add Forequarter to our Restaurants section while Underground Meats has already been added to our sources section. below are the tasting notes from the house-made sausages. A longer discussion of the smoked pork chop and sauerkraut meal created from the other items is forthcoming. Sausiccion Sec – literally meaning simply “dried sausage”, this offering is an excellent example of the tradition. Very firm, with nice fat marbling through-out, the flavor is akin to a high-quality, very fresh salami with a fairly rough grind. Kabanosy – A traditional, all-pork sausage in the Polish tradition. This a smoked sausage, rather than cured, and retains all the fresh pork flavors. A very simple, well-executed offering which was a nice addition to the plate sliced ¼ inch thick on the bias. Just as easily could be a sausage that you’d simply bite into as a Bloody Mary accompaniment. Spruce Goat – This is the seasonal offering version of the Goat sausage typically on offer in store and online for Underground Meats. In addition to the stronger meaty/gamey flavors of the goat (I’d say meaty, others would say gamey), the curing process adds the traditional cured overtones. Some tasting the sausage felt it had too powerful a flavor, verging of the ammonia-like aromatics that you can get in well-aged cheeses. The texture was dense and the dried fats reminded me of an imported prosciutto. These offerings and more are available on-line, but the retail location is definitely worth the visit. Note: We are pleased that Forequarter was also recognized by Bon Appetit as one of the 50 Best New Restaurants for 2013.